Detail is a killer. That double edged sword of perfection and psychosis. Easily distinguished and recognized by the least observant onlooker, admired by all. To exercise detail takes attention to every bolt texture, every radius, each minute feature being primped and worked until a complete picture is realized. A labor of pleasure and pain to be sure. I've heard the accusations of OCD and "picking fly poop out of pepper"; it takes a special dedicated breed to put the painstaking efforts into making a car build the most it can be. Couple that with the amount of dedication you find behind the Mk1 VW Golf chassis and an attention grabbing build suddenly becomes quite the tall order. Quality builds of such an iconic coach demand particular efforts to display something new and impressive. Applying late nights and long weekends to achieve that fettled factory finish yields big results when viewed by the strictest of connoisseurs, come show season. 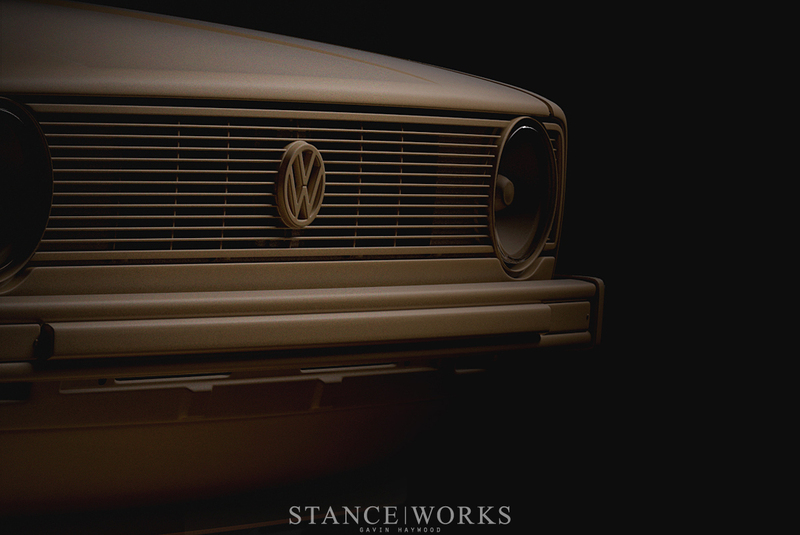 Gavin Haywood's Mk1 is hand sculpted to be something entirely fresh; something that the Mk1 community will have no choice but to see as perfect. Gavin has truly outdone himself here - 3 years into the project now and he still claims the car isn't finished. I believe him; but for the life of me can not see where anymore detail can be applied to this seemingly perfect Mk1. Gavin speaks to his perfectionist mindset: " It was always easier for me to restart... than to try [and] fix what mistakes I had made. The more I worked on the project, the better I became..." The entire car was completed by Gavin, at his own home. A remarkable feat considering the quality of what is pictured. 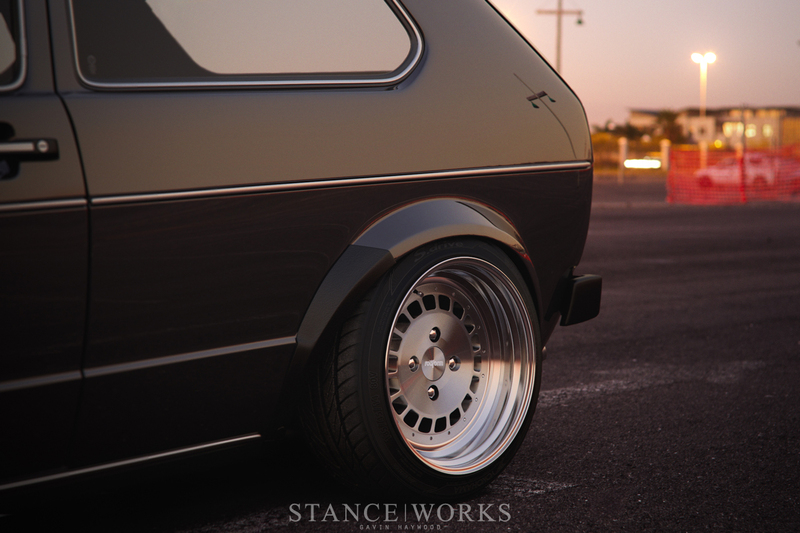 The Rotiform VCEs appear as appropriate as ever under the impressively crisp sheet metal fenders. Gavin wants to continue the build of the car with plastic bumpers and GTI arches. The reasons for change escape me: the car is flawless from every angle as it sits today. "As with any "build", it's never truly finished...It's taken me 3 years to get it to this point. Granted that is a long time, but there was even a period of 6 months where I didn't touch [it]." Reservation and control when doing a polished construction like this will always reap benefits. 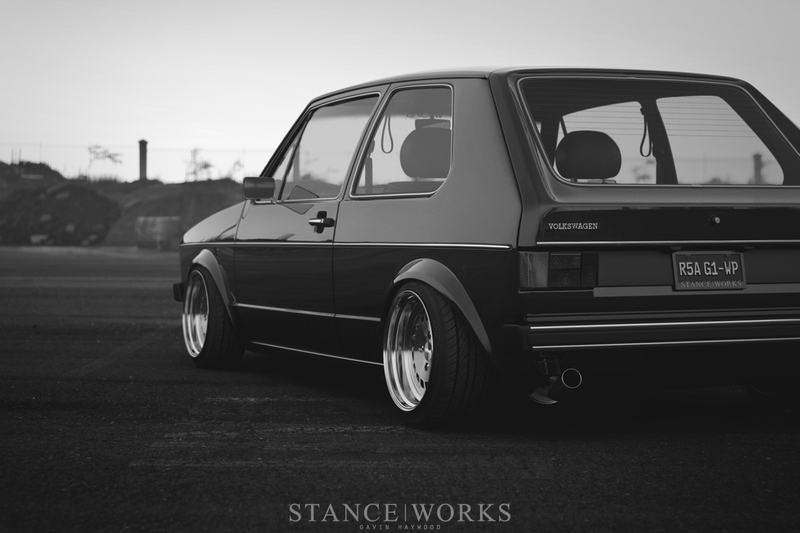 Next time you look at a Mk1 golf, you will remember this car. I guarantee it. Not much is left to desire when it comes to Haywood's Volkswagen. Every body panel is granite flat and dripping in the finest black lacquer. The glazing is crystal perfect. If I had to guess, it's like Haywood robbed the VW back warehouse of new old stock Mk1 parts, including a brand new Mk1 chassis. However, raiding the VW stash is not necessary for individuals that call South Africa home. 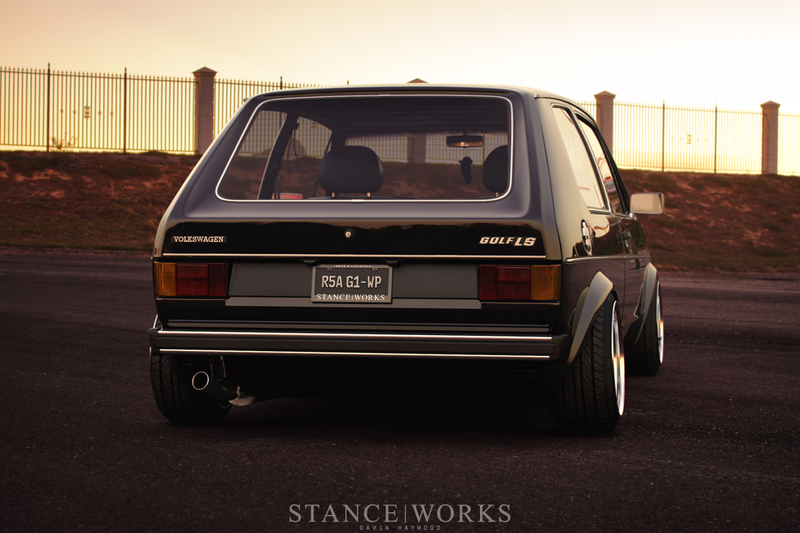 What may not be known to many is that in South Africa, the Mk1 Golf had a cousin named the Citi Golf that began production in 1984. The Citi Golf was a Mk1 production car that continued being offered by Volkswagen of South Africa almost immediately after the Mk1 assembly switched over in Germany. You may be thinking: "Oh, well that's it, Gavin found an 86' Mk1 Golf in better condition than an 83'." Well, it gets better than that; much better. The Citi golf continued production through the 80's, up to the 90's. Then the cars kept coming off the assembly line up to Y2K. Probably a pretty shocking bit of knowledge to the non-Volkswagen crowd. VWSA's (Volkswagen of South Africa's) very last Citi Golf to leave the production line went for a tour of the country at Volkswagen's expense, allowing loyal followers to adorn the freshly painted skin with their signature. Those lucky enough to put ink on the car were given the Citi Golf sticker you see hanging from the rear view of Gavin's car. That signed car took its tour in 2009. 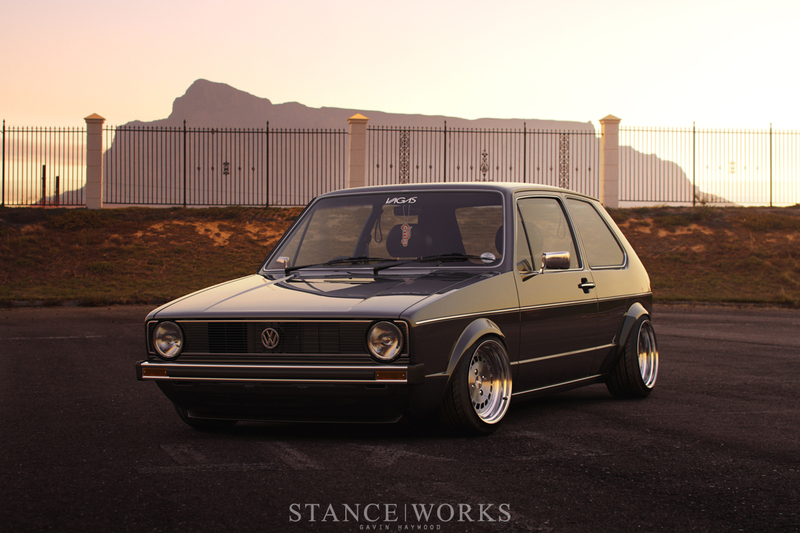 That's right, the Citi golf was produced in South Africa for 25 years after the Mk1 chassis gave way to the Mk2 in the rest of the world. Well this must be a 2009 Citi Golf then, like the ones described above. Those impressively clean details and even more impressive finish could only be from a factory fresh car. Truth of the matter is that this Golf isn't real. Well, I guess that's not exactly true. The car you see here is true to life, but only exists in a computer. 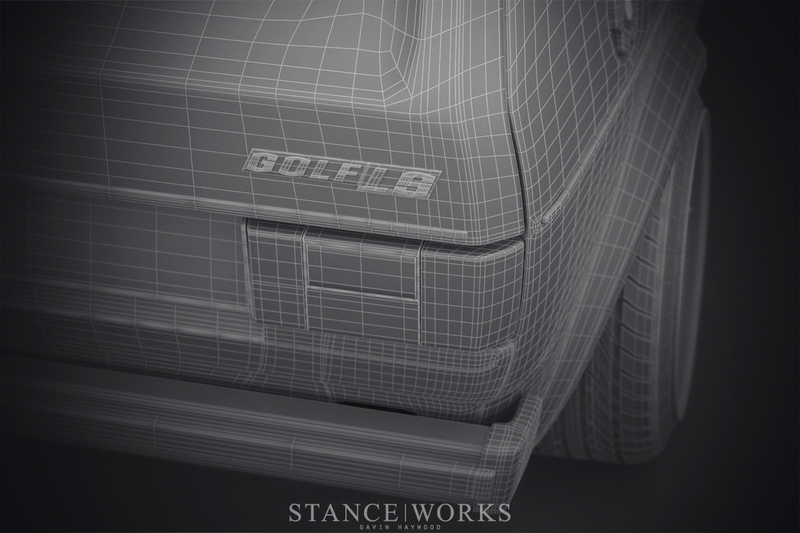 Gavin modeled the entire car in 3 space using a sophisticated meshing tool and rendering program. These modeling programs are derived from three dimensional computer aided design packages that typically make machine parts. 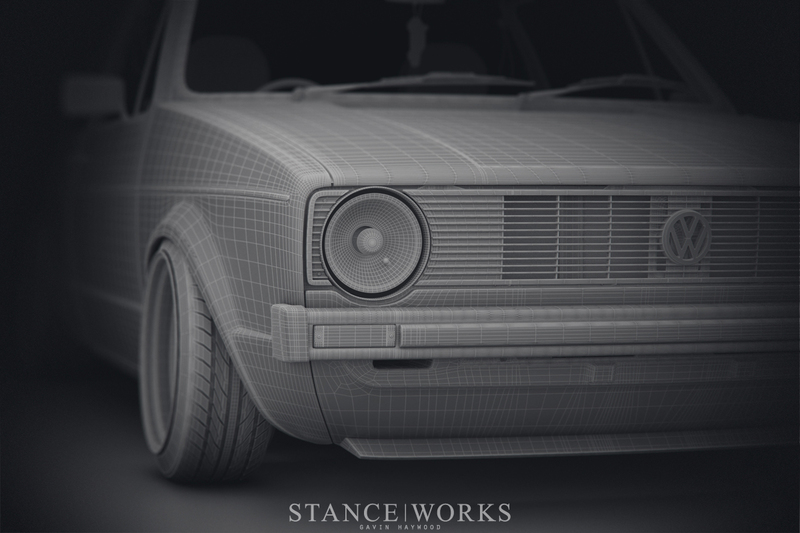 In this particular case, Gavin has meticulously recreated a Mk1 golf from scratch, using his own 5 door car as a starting point. Each feature of this car is constructed with a mesh of wire frame pieces which define a surface or polygon, each polygon fits into the four others it shares a side with. 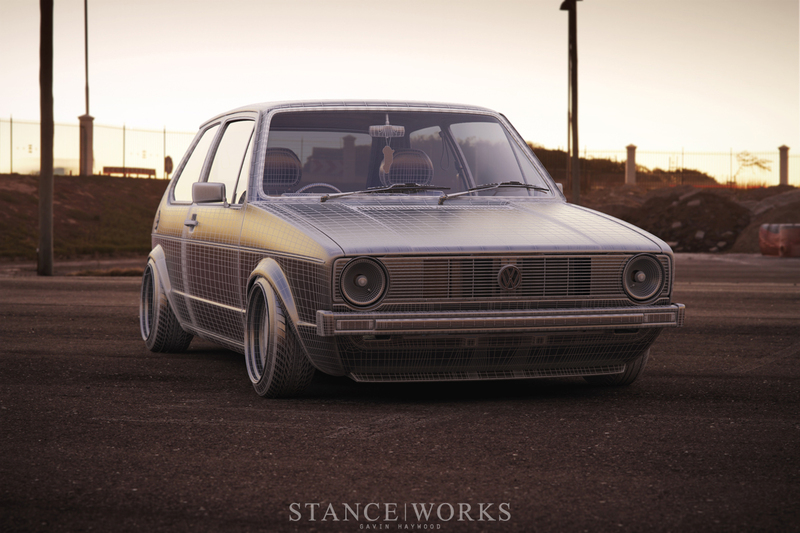 What Gavin has done here is create all those lines to produce a Mk1 Golf and accessories in exquisite detail. "I started by creating my own blueprints; a project in itself." The blueprints for the car started from Gavin's own. The car was photographed and he used a scale of measure to create the proportions for all the features he saw. " I've also been lucky in that I've been collecting parts for my car for many years, so I actually had spare parts like grills, bumpers, mirrors, tail-lights and handles that I was able to have right next to me while modeling." Each part modeled in its entirety, even down to the plastic casting marks on the rear tail light lenses. With the surfaces made and the contours massaged, the difficult task of creating textures and materials for the different pieces began. Then to create the lighting structure for the renderings to try and replicate the backdrop for the photos. Each task leading into the next to eventually create a symphony of realism. The renderings you see here speak for themselves. What Gavin has done is incredibly impressive. I am a mechanical engineer by trade and have created and seen many marketing presentations that have computer created images. If I'm being honest, I did a triple take when I saw these photos. Usually things like this do not get past me, but this one had me guessing. A credit to the creator. Rendering such fine points as you see here takes a considerable amount of time and planning. The background is a real image, shot on location over of the course of 2 hours. Even doing this is not as easy as one may think. The environment for the final images needs to be 3D. This means that the images need to be spherical in shape. So Gavin had to shoot the entire scene to create a dome of sorts for the placement of the 3D Mk1. This type of detail guarantees that the images shown in the reflections of the wheels, and body panels, which are behind the 'camera', are true to reality. The lighting effects need to be placed in this digital environment as well to replicate the lighting which is in the real scene. Further than that it takes tremendous computing to render the car, then place it into the digital set, and re-render the final image. The anti-aliasing turned up as high as it can go and the lighting effects means that a total of 6 hours needs to be dedicated to the creation of each image. Imagine if something was wrong? Now work a full time job. The dedication to this project is unparalleled, and every piece culminates into images which are breathtaking all on their own, and makes the real world seem, in a way, opaque. Up until now the approach to this article has been one of trickery, a slight of hand magic show which blurs the line between reality and fantasy. Although interesting, this isn't the entire story. 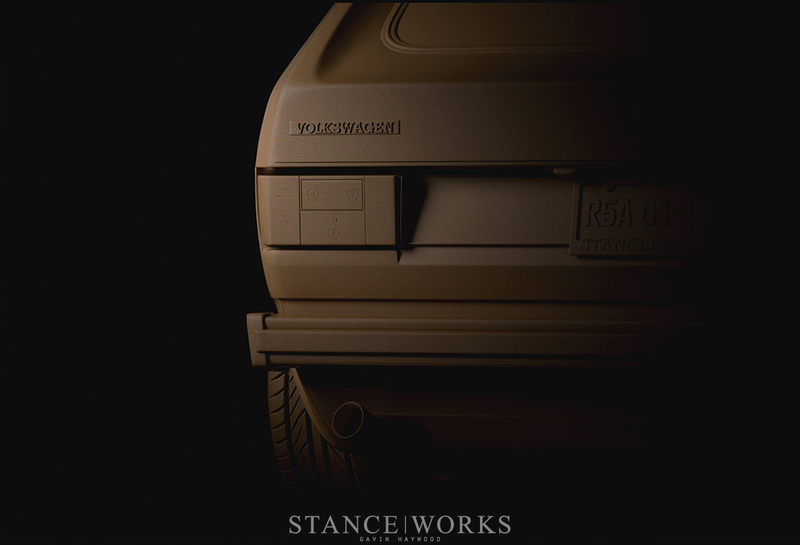 The volume of work shown is not about hours, days and years spent to fool the masses, rather an homage to the Mk1, the original we all know and love. The story that Gavin creates is one of community and belonging, much like car builds in the flesh do. The South African Mk1, and internet community helped Gavin with reference images of parts he didn't have, or actual measurements. Considering all the Citi Golfs in the country, there must be plenty of examples to take much needed information from. The 3D Mk1 here is a testament to the Volkswagen community bonding together much like they did for that final Citi Golf 4 years ago. A last hurrah for the car made of sheet metal, but a new beginning for its digital counterpart. Gavin speaks highly of the community he comes from and the country that he calls home. "In the Western Province here in SA, personalized number plates end in "WP". RSA G1 - WP stands for "Republic of South Africa Golf One". I wanted to include these details in the feature, in the hope that guys from SA would spot them and appreciate that they were included. Another element that was important for me to have was Table Mountain in the background." These subtle touches confirm that Gavin's creation is significantly more than the sum of the meshes, textures, or ones and zeroes. Instead it represents a car community in the part of the earth that means something to him. The details here paint the picture of community, passion and hard work. Well done Gav!! Super proud mate! Kenny & Jess. AMAZING!!! Well done Gavin. Absolutely killed it. You’ve been keeping this goodness from us. Had no idea you were on this level already. This is truly amazing Gavin Haywood, you make us proud to be South Africans as this work is beyond perfection! You’ve made your mark on the world and put Cape Town,South Africa on the map! 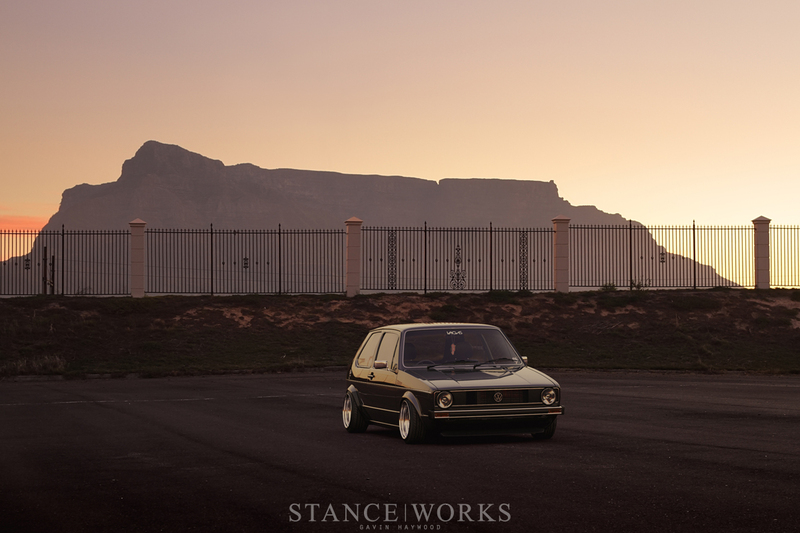 Big ups to StanceWorks for this feature, pushing the license plates and Table Mountain in the background in the pics and the write up. This couldnt have been done anything better! Well Done and goodluck on the rest of the work on this rendering Gavin! We’re extremely proud of you. Well my dreams were completely shat on when I found out it was fake. Still, amazing work and a nice bit of trivia learned. 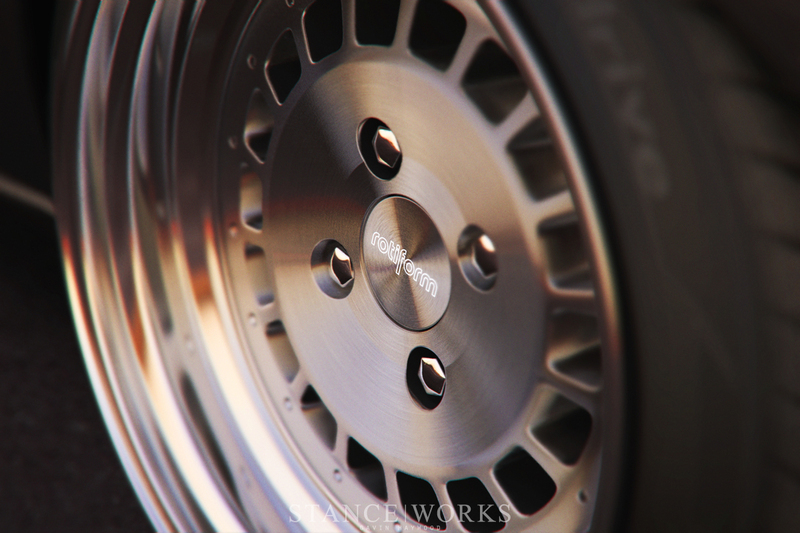 Gavin uses 3Ds Max and Metal Ray rendering software. I chose not to mention that in the article because it seemed a bit too techie. Great work Gavin! Really enjoyed doing the article for you. 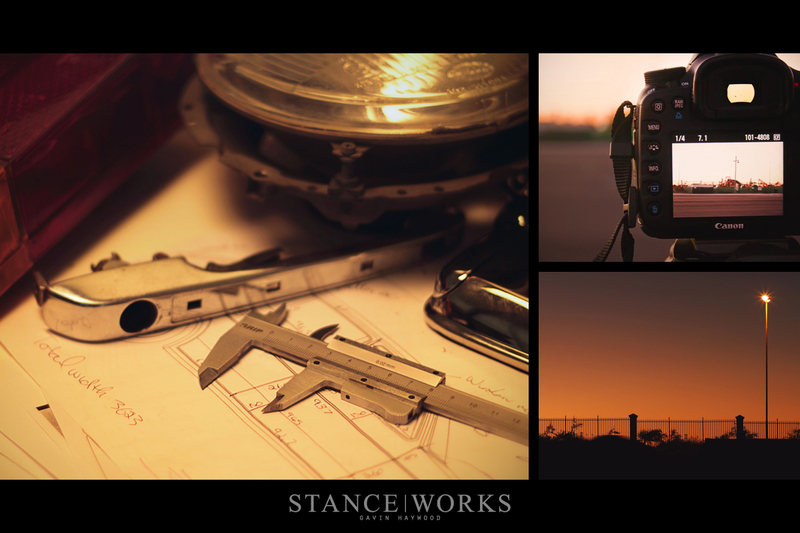 Anyway, I’m happy to see the guys at Stanceworks are taking a look at the 3D side of life :). There are some truly talented and passionate people which spend an awful lot of time working on these 3D models, and they deserve all the attention and appreciation. I hope to see more of these here in the future. wow, great, a silly fake car. 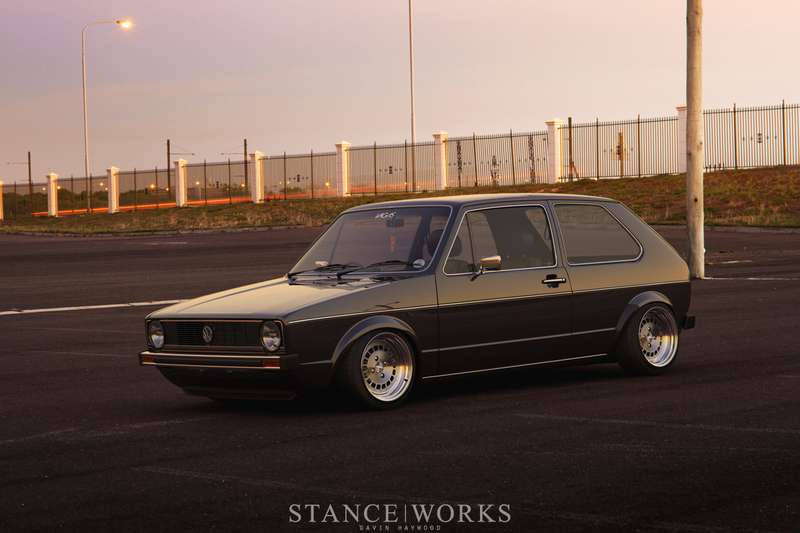 Well at least he isn’t destroying another real mk1 like all the other stance people. Amazing article. I’m a mechanical engineering student and i’ve done a bit of rendering too. Mostly on coffee breaks at work where i can use a proper computer and Catia v5. I was blown away when i realized that this wasn’t real. Respect Gavin! <a href=”http://membermoment.net”>propolis moment</a> I’ve seen your awareness about this theme whenever you post it and it really gives an informational message to us readers. I am hoping that you’ll continue writing this kind of blog. Thanks for sharing this information. hi dude, thats awesome ! can u share your blueprint reference ?? could be very cool !